By controlling the growing environment in a commercial greenhouse and being able to manipulate the weather at any time, Energy Shield Curtain Systems manufactured by Agra Tech, one of the world’s leading manufacturers of commercial greenhouses, are used by growers throughout the country for a plethora of different uses. John Pound, owner of Agra Tech, Inc. has seen literally thousands of applications for his greenhouses in conjunction with his Energy Curtains, so he knows the best ways to use them and how to achieve optimum results in almost any greenhouse scenario, he said. In short, Agra Tech’s Energy Curtains are retractable interior ceiling curtains system manufactured for use in Agra Tech greenhouses. All Agra Tech structures are factory punched to accept the Energy Shield, which allows growers to add them conveniently after they install their greenhouses and are up and running. By choosing from a wide range of shade fabrics that have been designed to reflect excess sun back out the roof in greenhouses, Energy Curtains by Agra Tech, Inc. can provide a cooler climate in the greenhouse if desired. By using thermal curtain fabrics, growers can retain more heat in their greenhouse on cool days and overnight. Most fabrics on Agra Tech’s energy curtains have both shade and thermal value, making them versatile and thereby easier to use. The basic features built into Agra Tech’s curtain systems improve growing environments while maximizing energy savings; enhancing space utilization, and assuring continued problem-free performance. They’re available in Slope-Flat-Slope systems or can be used in a Flat system. All Agra Tech Energy Curtains can be either computer or manually controlled, powered by Agra Tech’s certified motor/gearboxes and controllers. The Energy Shield Curtain System can also be retro-fitted into non-ATI greenhouses. 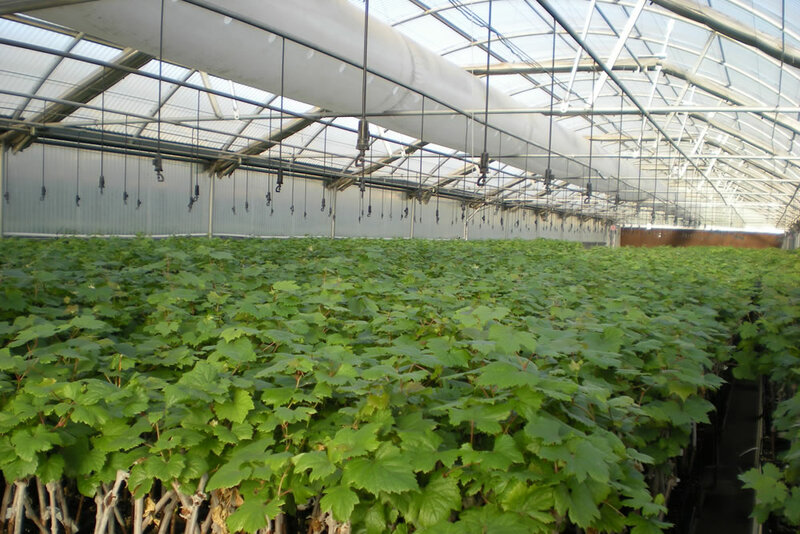 Sunridge Nurseries in Bakersfield, California uses Agra Tech, Inc.’s Energy Curtains in all of its 28 ATI greenhouses, as they help the company to produce more than 6 million grape vines annually for wineries worldwide. Eloy Rodriguez oversees the growing of these vines and could not do his job as effectively without his Energy Curtains, he explained. A dryer growing climate is maintained due to the air mass below the curtain that enables excellent air circulation. Morning crop shock is minimized because there is less cold ceiling air above the curtain to drop on the crop when the curtain opens. Better energy savings are achieved because of the small air space between the curtain and the glazing. Space is better utilized because equipment can be hung below the curtain, leaving ample room above the curtain for ridge vents. Push-pull describes the drive mechanics of the system. It is a high strength, low friction, rigid system requiring little maintenance. The curtain is pushed and pulled to open and close. Continuous 1 3/8″ pipes run from end to end of the greenhouse connecting the entire system together. They are driven by steel racks and pinions and supported within low friction roller guides. Galvanized steel racks and pinions for long life and low maintenance. “The team at Agra Tech met the challenge and did a great job from start to finish,” Thomson said. “The completed house system is state of the art with fully integrated & automated controls for all operational aspects; fan speeds, lighting, cooling system, shade curtains and includes a PC based program interface that provides for monitoring system performance and set up. When small build issues arose, as they will, the Agra team stepped up and responded quickly to resolve the challenge. The new greenhouse represents a significant jump forward for Lundberg Family Farms not only in the overall system but also in the Head House space that was custom created for our own team. Agra Tech and Ag-Con worked in conjunction with our General Contractor to tie in a custom head house built by our general with a state of the art Green House, they did an excellent job.